Colton boys' basketball team has faced the best and worst at the 2A level in back to back contests. On Monday, Jan. 28 the Vikings squared up with the No. 1 team in the state, Western Christian Pioneers and fell 86-52 after four quarters of play. The team was defeated in the team's first matchup on Jan. 7 as well, losing 87-38 in that contest. Against the Pioneers this time around Colton saw several of its players put up strong numbers. Senior Javontae Maes led the team with 20 points, 6 rebounds, and 2 assists, followed by fellow senior James Parker with 10 points, 7 rebounds, and 5 assists. Vikings Seth Ethington and Donny Maes each had 8 rebounds in the game, and combined for 11 points. "Anytime you have the No. 1 team in the state going in, they were hyped and ready to go," Colton coach Dan Chapman said. "They wanted to test their skills and ability, and I felt we played a lot cleaner of a game than we did when we went to their place." Colton actually outscored the overall No. 1 team 18-15 in the fourth quarter, but it was too little too late after being outscored 57-21 in the first half. In the follow up contest against Gervais on Wednesday, Jan. 30, Colton was able to rebound in a big way. The visiting Cougars had gone 0-20 leading up to that contest, including dropping the first meeting 62-30 on Thursday, Jan. 10. To start out the second encounter, Gervais got up 6-2 over the no. 6 team in the Tri-River Conference. After that though, the visiting team's success dwindled. Colton put together several streaks of consistent offense to take a commanding 33-15 lead at the half. From there, the Vikings continued to press the action and keep the Gervais offense from finding its footing at range and inside the key. In the third quarter, the team's defense only allowed nine points. Colton also outrebounded the winless Cougars 49-21, and forced 23 turnovers. Gervais also shot just 26 percent from the field. "I feel like when we got focused on our press, we were on and that's when you saw the turnovers coming," Chapman said. "I felt like coming in on senior night, maybe the kids were a little nervous and we weren't very clean in the first quarter. I thought there was a lack of focus, but it's a big night and I get it. Their nerves are going. But we settled in, the rotations were key, and our half-court defense started rotating correctly. We blocked out really well and hit the boards really well." Chapman focused his rotation on the senior members of the team, who were recognized earlier on the team's senior night. Of particular interest was senior Chance Ritchie, who got playing time after a month away dealing with an aggravated leg injury. The time off was beneficial for Ritchie, according to Chapman, because he got to work with the coaching staff in a different capacity. "All of the sudden he's seeing the game so much differently than when you're a player going at it," Chapman said. "He's not just sitting out. He sees things because he's on the bench throughout the game, he's seeing our shot chart, and now he's seeing the rotations that maybe guys don't ever see until they have a chance to sit back and watch. He was almost like another coach on the floor tonight in his limited spots. That was huge, and pretty uplifting for these guys." Couple that with Colton's go ahead scoring and the game was well in hand. The Vikings had 18 assists on 26 field goals made, and had Javontae Maes and Parker both score double digits in the contest. With the season winding down, Chapman hopes that his team embrace the grind and have fun with the rest of the season. If they do that, the first year coach expects to win out. "My expectation is to go out and win out," Chapman said. "The no. 1 goal is to take care of business. If we do the things we should be doing and that we're capable of doing, we will win out. That's my expectation, that's where the bar is at. Hopefully they appreciate every minute of the journey for this next week and a half or so, the seniors especially." The Vikings (5-9 in the Tri-River Conference, 6-16 overall) picked up another win over the Culver Bulldogs (2-12 in the TRC, 2-20 overall) on Friday, Feb. 1, this time 58-28. 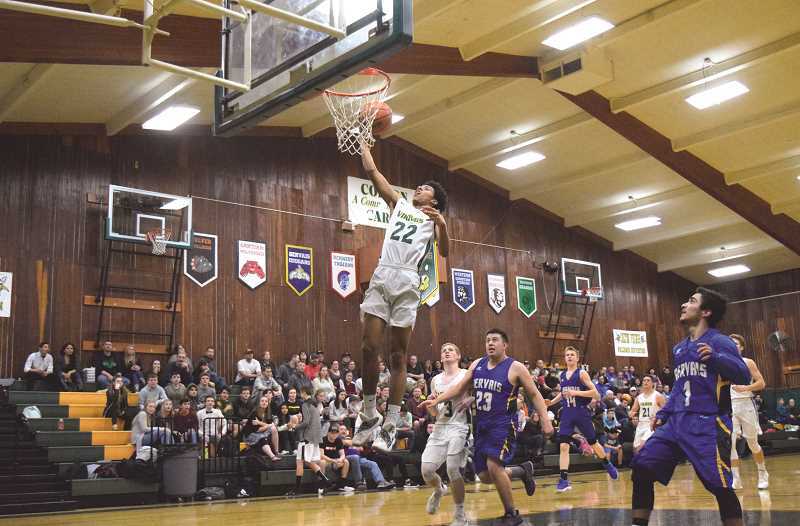 With just two games left for Colton, they square off first with Delphian (2-12 in the TRC, 3-15 overall) on Tuesday, Feb. 5 in its last home game. The final game of the season will come against Chemawa (8-6 in the TRC, 10-10 overall) on Thursday, Feb. 7.